CA has encountered some growing pains in the consumer security software market. It's used licensing agreements, purchased other companies (Tiny Software) and changed product names more than we care to remember. This latest product is based on Tiny code. CA has got some things right. The user interface has been simplified and is more unified than it's ever been. Most tasks are easy to accomplish, including the configuration of advanced rules. Don't be misled by the price, either - for £30 you can install the program on up to three PCs. On the performance front, we were impressed by the product's relatively low resource utilisation and happy that it passed our port scan test. Some of the more advanced features that will prove useful include support for both IPv4 and v6 traffic and the ability to schedule firewall rules. CA still has a way to go on the security side of things. 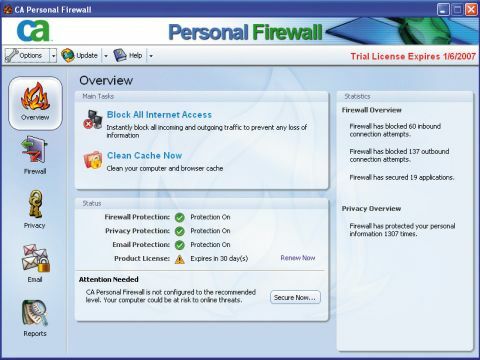 The firewall's process was easily defeated by our kill tests, making it highly susceptible to closure by malware and other pests. When we put our leak test tools against it, it recognised and blocked only the most common and basic, allowing those that employed even basic trickery to pass unnoticed. From a security standpoint, that's just not acceptable. There are some reasons for hope, however. One is the inclusion of a robust ID theft component designed to keep sensitive personal details safe - it worked flawlessly in our tests. Additionally, the program's Email Protection feature is great, helping to limit the potential for your PC to be used as a spamming zombie.